What's prettier than birds and blooms, we have plenty around the yard now. I still have many trip photos to share but I wanted to share my backyard blooms, moon photo and some birds. I hope you enjoy. Our crazy House Wren controls our yard, he chases away any bird that comes near. The clematis is blooming nicely. Our rhododendrons are looking beautiful too. 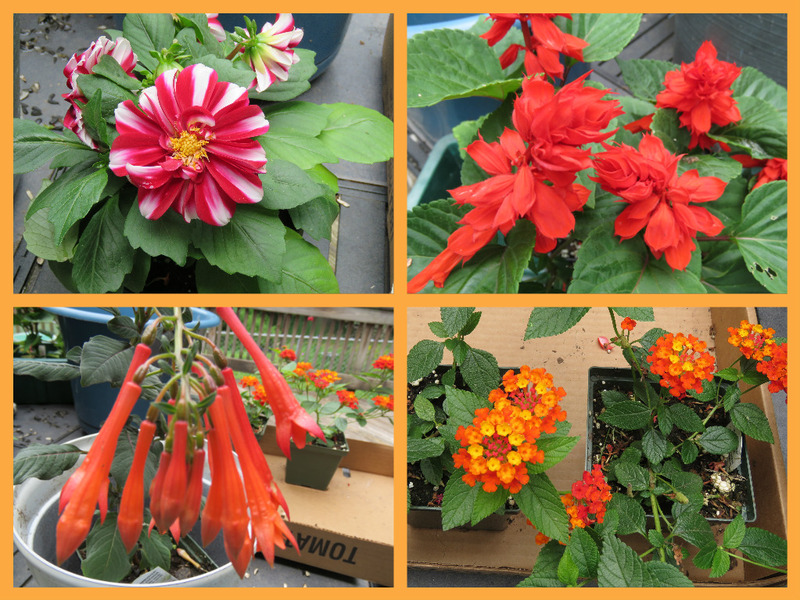 We picked out some annuals that the hummingbird and maybe the butterflies will like: top left is a Dahlia that reminds me of the red and white peppermints, the red Salvia, bottom left is a new plant for us is called upright Fuchsia and lower right my favorite Lantana. I enjoy watching the sky and pretty clouds shapes. 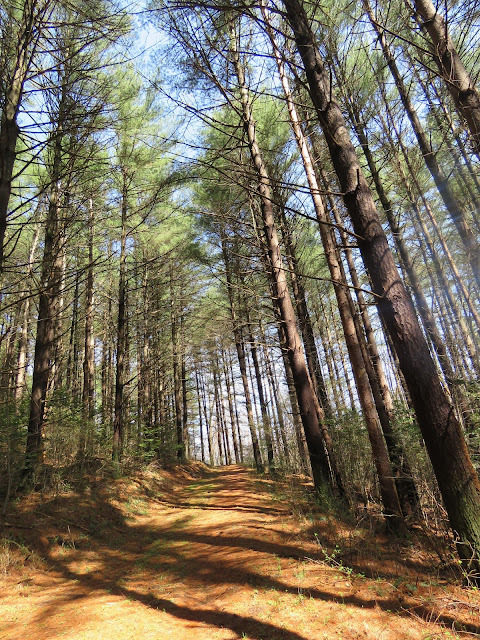 This photo was taken while walking on our local fire road. I am thankful for our local nursery, they have a great selection of perennials and annuals. I am thankful for the pretty flowers. Good Morning, Eileen. Your yard/flowers are so pretty. The hummingbirds will love your choice of annuals. We had pretty clouds yesterday. Thanks for sharing the beauty from your day. House Wrens are such pugnacious little critters. It always amazes me that they will take on a bird of any size. ...yep, lots to be thankful for! Excelentes e belas fotografias, bom trabalho, gostei. Gorgeous blooms. And the finches seem to like the sack. Wrens do have a mind of their own. We were rejected this year. They checked out the house and moved on. Your clematis and the rhododendrons are so beautifully bloomed! The House Wrens is such a beautiful bird! Hope yo see soon,in your yard your beloved hummingbirds! Thank you for sharing this beauty from your yard! We live in the same world, only with a few thousand miles apart, so I can also say that I am grateful for these beautiful pictures. Thank you so much! Loved this post Eileen . . . Saving the quotes, I will be using this one pronto! beautiful images of moon and clouds and flowers...but I am captured by your Wren! They are so funny birds...so tiny and so brisk! Beautiful flowers. I remember how Lady Bird urged everyone to plant a bush or a shrub! I think I may have a crazy house wren in my bird house, which means with babies probably. I've seen it only a couple of times but hear her a lot! Lovely as always! Our wrens are pretty bossy too but I do enjoy watching them. Beautiful flowers, Eileen. I haven't seen the Fuchsia either. I have some Lantana planted in a pot too with some Zinnias. Summer colors are just beautiful and so eye-catching. You have a beautiful yard, thanks for sharing it with us. Thank you for being such a bright spot!!! Thanks for all of the color today. Stunning shots! What beautiful flowers and birds...you have a lovely yard! Wonderful birds and flowers! I love your clematis and rhododendron. They are all so nice. Your flowers are beautiful, Eileen! "Three things can not be long hidden: the sun, the moon and the truth." Beautiful flowers. Dahlias are a favorite. I don't see many rhododendrons around here. Loved seeing them when I lived in North Carolina. Along with azaleas. That city turns into a flower in the spring. I like cloud shapes, too. Cute that you have the wren in charge of security! lol Thanks for linking up today. You have some beautiful flower shots, here. Beautiful flowers..love the quotes..Little Jenny Wren is adorable!! Beautiful blooms. LOVE the picture of the wren. What a lovely series of shots. That moon though - wow! What a fantastic photo of the House Wren. A beautiful bird. And the garden looks lovely, Eileen, I hope you are enjoying the summer. Flowers, birds, moon and a cloudy sky in ones backyard. How romantic! Your flowers are beautiful and you've made an awesome shot of the moon again. I hope you'll have a wonderful weekend. Lovely, blooms, birds and sky shot! The Buddha saying got my attention. We need truth in the age of alternative facts. Wow, spectacular moon shot, I love the detail. I love the quote about the Earth laughing in flowers. And your flowers are spectacular. I doubt I quit blogging. I get too much satisfaction out of it. Wonderful post, Eileen, pretty flowers, very nice moon and amazing sky. Such beauty all around us. Have a wonderful weekend. So much to be thankful for, and we should all take time to reflect on this. Great to see the birds and the blooms. Love that moon, LOL about the bossy wren, and beautiful sky shot! Have a great weekend. Eileen - sometimes the daily world around us just trumps our reports on our vacations … we are compelled to share the beauty that is just outside the sliding glass door. For one, I am so glad you shared these images. All wonderful! Especially the clematis. Yep EIleen, all us little Wrens are a little bit crazy! Never mess with a house wren on a mission haha. I love your wonderful photo of your wren, you back yard looks a wonderful picture at the moment too.